Langston is a local UIUC student painting a bike-themed mural at the back of Cafeteria and Company, a locally sourced food & drink collective coming soon to downtown Urbana. Langston's goal is to not only complete his current mural, but also to help revitalize underused parts of the downtown area by extending the mural to other buildings in the neighborhood. 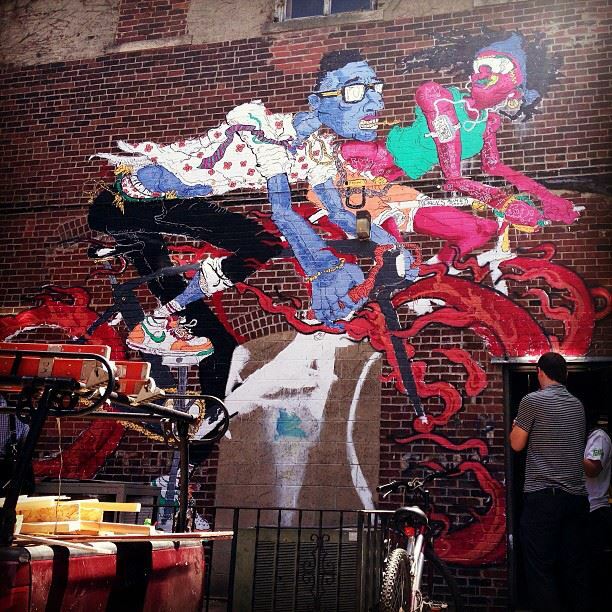 If you back Langston's mural project, you can get an original sketch or painting created by Langston in return. But act fast and back the project before July 10. For more info click the link above and check out the articles written about him in the News Gazette and Smile Politely. Cafeteria and Company's goal is to provide local food businesses with a place to start and/or grow their business. Pizza M currently serves pizza at Mirabelle Bakery on Thursday through Saturday nights but will be moving into Cafeteria and Company in the next few months to open a full service pizza shop. Pizza-maker Matt Kitzmiller is currently raising money to help purchase pizza ovens for his full-time pizza shop in Cafeteria and Company. Help fund this project, get a free pizza, and then come down to Cafeteria and Company to try the pizza you helped bring there. Back this project by Monday, July 15! Check out the link above for more information and check out the articles written by the City of Urbana and Smile Politely. Chef Josh Boyd is known for preparing the late night menu at Black Dog Smoke and Ale House. His current goal is to open a butcher shop in downtown Urbana. He is excited about being a part of Urbana's downtown revitalization, both by opening up shop and by sourcing other local businesses - such as Pizza M (above)! Help fund the butcher shop and receive t-shirts, charcuterie and invitations to hang out with the brains behind this project and the chef behind the meat. Back this project by Monday, July 8! Check out the link above for more information and check out the articles written by the City of Urbana and Smile Politely. ============= As a social media enthusiast, I love crowdfunding. It provides a unique way to invest into local artists and businesses and get a cool piece of their early history - in this case, art or food! As you can see, many of these project are connected. Langston's artwork is behind Cafeteria and Company which hosts Pizza M which will use sausage made by the Butcher: Sausages & Charcuterie. As a new Chambana resident, I love to see what the City of Urbana is doing to help small businesses and local artists and what these businesses and artists are doing to support one another. Check out a recent #SMLiveECI interview with the City of Urbana where they share about revitalization projects in downtown Urbana and the role that crowdfunding and social media plays in the process. Also, check out Flying Machine Coffee and [co][lab] for information on other Downtown Urbana businesses in the mix.